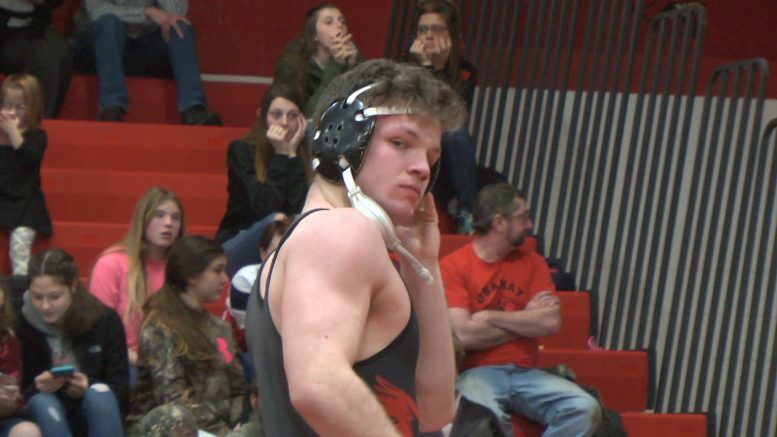 Whittemore-Prescott's Ridge Schutte earned career win number 161 against Onaway's Colby Parly. ONAWAY — The Cardinals hosted Whittemore-Prescott, Oscoda, and Rogers City in a four team meet. Rogers City and Onaway faced off in the first meet, while Whittimore took on Oscoda on a separate mat in the gym. Oscoda got pins from Andy Dault and Christian Ward en route to 45-30 win over the Cardinals. Across the gym, Rogers City managed one pin against Onaway, coming from Caden Fenstermaker (103). The Hurons lone win in the match gave them 6 points in the 72-6 loss. The second match featured both Cardinal teams against each other, while the Hurons and Owls faced off on the second mat. Caden Fenstermaker got his second pin of the night against Oscoda’s James London. Austin Bielas (135) also got a pin also managed a pin for RC against Greyson Rayes. Donny Ellis (189) got the win and pin versus Dylan Daughtrey as the Owls won the match 57-24. On the other side of the gym, the Cardinal vs. Cardinal match up featured 6 pins. Whittemore revived pins from David Candy (103) and Ridge Schutte (189). The win also marked career number 161 for Schutte. Aidan Fry (112), Seth Enos (152), Gavin Fenstermaker (171), and Declan Clayton (285) all earned pins for Onaway as they won 51-26. Onaway and Oscoda went 2-0 on the night, while Rogers City and Whittemore-Prescott were 0-2. Regionals begin February 13th.